Unlike it's competitor, the Ledger is slick, and comes in a package to match. It's limited to using only a smaller number of currencies at the same time due to the way it operates, but additionally has new currencies constantly being added. Its downloadable apps make for a much simpler way to manage and use wallets. As cryptocurrency technology continues to evolve, it's now more important than ever to ensure your storage medium is efficient, secure, and easy to use. 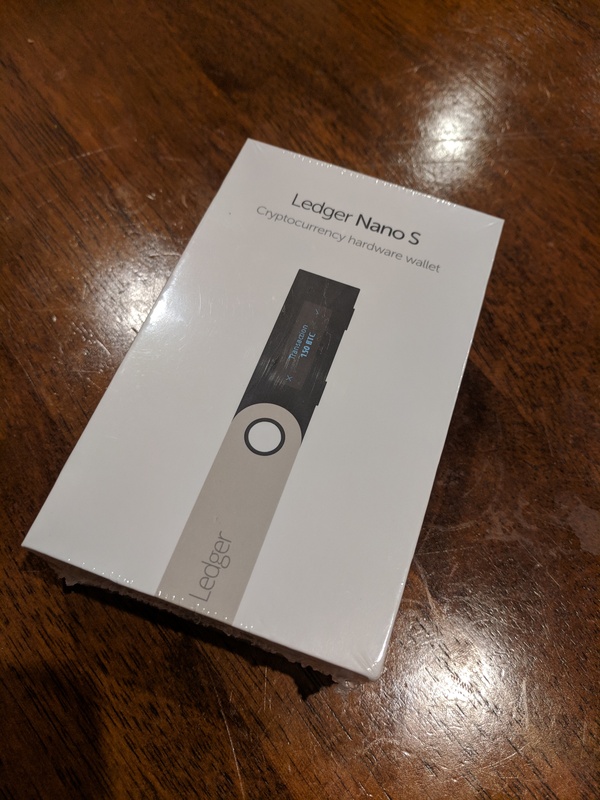 Hardware wallets, for example, have become a popular choice for storing large amounts of currency; while desktop or online wallets must constantly adapt to the risk of malware, keyloggers, or sophisticated phishing techniques, a dedicated physical wallet can be worth its weight in gold. Two of the most popular hardware wallets on the market today come courtesy of Trezor and Ledger. Below, we'll compare the two products, and give a few reasons why the discerning cryptocurrency user should strongly consider investing in a hardware wallet. Both wallets come from well-established companies with a proven track record of security. Like virtually any hardware wallet, these devices record coin data on the blockchain without requiring the use of a desktop or online environment. The physical nature of these wallets mean users do not need to employ the same counter-theft precautions as software-based wallets require, and are accessed using a physical PIN. Like software wallets, however, both Trezor and Ledger's physical wallets can be restored via "seed" words, meaning loss or destruction of the wallet does not means loss of your cryptocurrency. Either wallet can be treated much like a real-life wallet, and by employing the same common-sense precautions you would with physical currency, the risk of loss due to theft is substantially reduced. Trezor is an offline-only, highly-secure cold storage device. However, it also provides great flexibility and connectivity should the user need to exchange currency. Trezor is a highly-respected manufacturer of hardware wallets in the crypto community, and the Trezor wallet is remarkably small, roughly the size of a small mp3 player, and constructed from plastic. Trezor's wallet connects via USB, does not require charging, and is compatible with Windows, MacOS, and virtually any Linux distro, as well as Android devices. Several browser extensions for Chrome and Firefox are available also. Inside the box, the wallet is accompanied by a hanging strap, USB cable, user manual card, and two nifty recovery seed cards for storing your seed information. The Trezor Wallet has support through the community through Trezor's code on Github, which increases transparency and ultimately security. The Trezor wallet does not utilise a "secure element" within it's circuitry, which has been met with skepticism by some. Trezor's response to not using a secure element is broken up into 5 points. 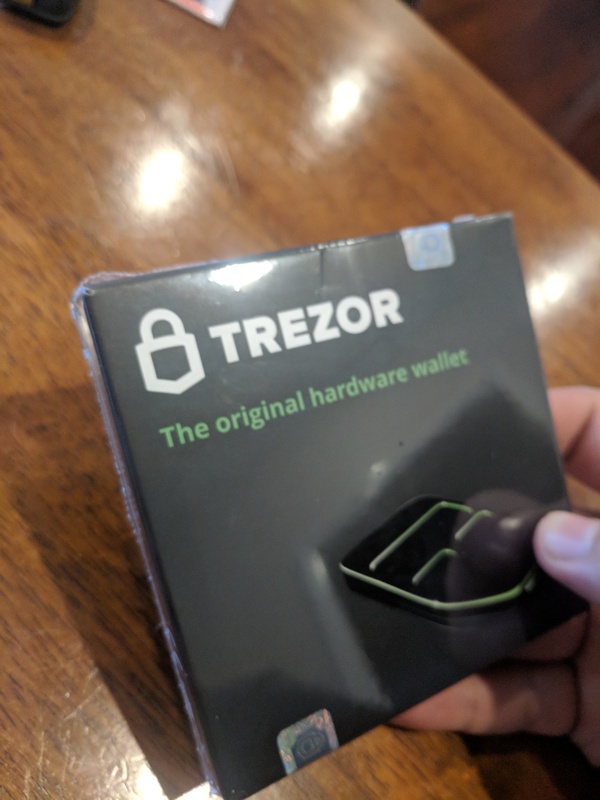 The Trezor packaging is simple. It's slimmer and less modern and pretty, but we would never judge a book by its cover, would we? Ledger likewise maintains a small form factor, roughly the size of an average USB flash drive. Also a well-respected wallet manufacturer, Ledger is compatible with Windows and MacOS, though the manufacturer does not explicitly mention dedicated Linux support. The Ledger is also compatible with Chrome OS, and like Trezor, several browser extension downloads are also available. Unlike Trezor, however, Ledger enjoys a sleek form factor and durable steel construction for heightened resistance to drops and damage. Both devices include small display screens, though Ledger's screen is slightly smaller than the display on the Trezor (a requirement for Ledger's sleek form-factor). 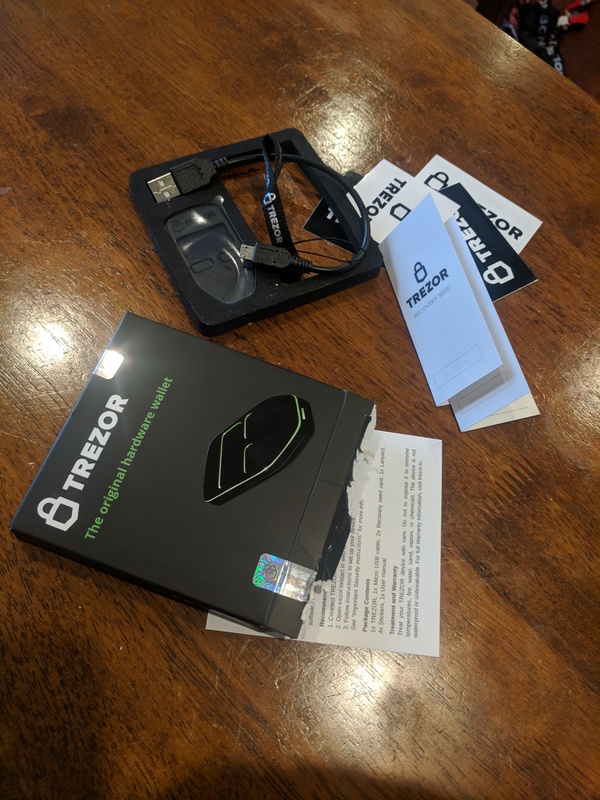 Like Trezor, Ledger includes a USB cable, instruction card, and seed recovery card. In addition, Ledger also ships with a handy keychain and lanyard for portability. Ledge offers user's a way to verify the integrity of their hardware wallet, which is also a nice touch. The Trezor wallet features a simple, clean interface, making it a snap to quickly view transactions. The menu on the top of the screen allows swapping through different currency types on the fly, and all boxes and menus are neatly labeled. Likewise, the Ledger features a clean, minimalist interface will easy-to-read labels and menus. Both wallets allow you to monitor any of your cryptocurrency types on the same screen, as well as transacting in any currency type. Both boast a well-designed, user-friendly interface. Trezor can store an enormous selection of cryptocurrencies, and the manufacturers are constantly adding support for new currencies. That being said, Trezor does not fully support all currencies, though the list is always growing. Trezor does provide full support, however, for virtually all popular coins, listed in the comparison below. For Dropbox users, Trezor's interface can also automatically sync your transaction information via Dropbox, a feature Ledger lacks. Unlike Ledger, Trezor also supports master password administration, and boasts a slightly more robust firmware than Ledger's more limited offerings. Ledger, on the other hand, boasts full support for several additional currencies. It does this through the use of Chrome based apps, which may be deprecated sometime in the future. The Ledger apps are much simpler to use than the Trezor interfaces, however, can be confusing when using the Bitcoin wallet, due to confusion around whether to use Segwit compatibility or not. Both devices are always adding new features and currency support. For users with very diverse portfolios, it may be worthwhile to use both wallets. Both devices feature a quick setup process out of the box. For either, the user will first set up a pin code to access the device. The user is allowed three attempts at entering the correct pin; after three failed attempts, the device will automatically wipe all data on the device. In the event of a full data-wipe, recovery seeds can be used to restore the wallet data. Your seed is not displayed on the device screen, ensuring that any would-be thieves must be able to enter the correct PIN number within three tries. Both devices feature two small scrolling buttons, used to navigate menus or select entries. No data can be accessed without a connection to a computer and the proper PIN code entry. While the Trezor has a slight advantage in ease-of-use due to Its larger display, both devices are extremely simple to use with clear menus and easy entry of numbers. If you're on the fence deciding between the two, it would be better to base your decision of the form-factor and currency support of the device, as both are relatively even in terms of usability. Both devices are virtually identical in terms of usability, interface clarity, and transaction (send/receive) capability. That being said, Trezor is slightly more expensive: while Ledger can frequently be found for around $60 USD, Trezor typically runs closer to $100. While both wallets are constantly upgrading support for new currencies, at the moment, Ledger takes the win with a greater array of fully supported currencies. On the other hand, users with a smaller portfolio of currencies may enjoy Trezor's more robust set of firmware features. Ultimately, it's difficult to label one as better than the other. Both are highly secure, well-made products from reputable companies, with a minimal difference in price. In either case, Trezor or Ledger will both grant the user a well-designed interface, unmatched cryptocurrency storage security, and support for a wide variety of currencies. The user's decision should boil down to which device is more appealing in construction, and most importantly, which offers the best OS and currency support for your intended use.